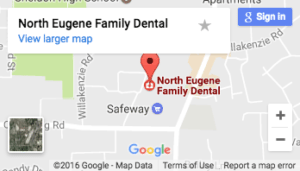 When it comes to protecting the oral health of our patients, your dentist in North Eugene strives to provide the kind of preventative care needed to protect the health of your teeth and gums now and in the future. That’s why every dental exam with our team at North Eugene Family Dental includes in oral cancer screening. Each year over 49,000 Americans receive an oral cancer diagnosis, resulting in nearly 10,000 deaths. These numbers place fatality rate of oral cancer as higher than Hodgkin’s lymphoma, testicular, thyroid, and throat cancer. That oral cancer has such a high mortality rate occurs not because the disease is particularly hard to diagnosis or treat, but because the majority of cases are caught late in the cancer’s development. The early stages of oral cancer can develop completely unnoticed by the patient, as it can frequently thrive without causing any pain or discomfort that might cause someone to seek medical care. If patients fail to regularly visit the dentist to receive cleanings and checkups, they lose what little preventative measures they have available to spot the disease early on while still easily treatable. Early detection is key when treating every form of cancer. Unfortunately, many cancer patients receive their diagnosis too late, after only seeking medical treatment once symptoms have manifest that mean the disease has already progressed to a more difficult to treat stage. But now, a new breakthrough may help to lower the number of deaths caused by oral and other forms of cancer each year. A chewing gum is being developed that could help to identify whether an individual suffers from cancer. Even more encouraging, this new life saving gum produced by the company Volatile Analysis may soon be available to the public. The product works by absorbing “volatiles” in the saliva of individuals as they chew the gum. Once the gum has absorbed enough saliva it is then examined to determine whether the chemicals inside the body could lead to the development of cancer. According to Volatile Analysis, the body generates chemicals referred to as volatile organic compounds. These types of compounds exhibit unique identifiers for every type of cancer. This allows your dentist in North Eugene and doctors to easily identify which type of cancer a patient may develop by understanding which of those compounds are found in the chewing gum. By using the newly developed chewing gum, patients no longer need to endure the uncomfortable urine and blood tests currently used to diagnosis cancer. Gum makes for the ideal delivery system for testing for cancer because it stays in the mouth for a longer period to absorb a large enough sample while being durable enough to endure repeated testing, according to researchers. Gum also offers the ability to be easily transportable, making it more likely that patients without easy access to medical care can receive a cancer diagnosis without needing to schedule an office visit to take a blood or urine sample. While further testing is needed before launch, Volatile Analysis hopes to have their product available for use in the near future. Preventative dental care plays a variety of roles in protecting your oral and overall health. Regular cleanings help to eliminate plaque buildup that can cause the development of tooth decay and gum disease, while regular exams allow your dentist in North Eugene to spot the signs of any oral disease early on while still easily treatable. In recent years, a growing amount of research has shown that our oral and overall health are linked in ways science did not previously expect. While these new connections continue to emerge, it has become clear that taking care of our oral health offers far more than just a future of health teeth and gums. It can literally be the difference between life and death.